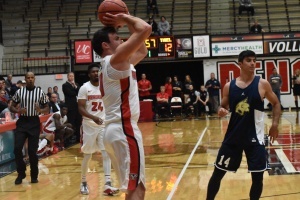 The Youngstown State University men’s basketball team is coming off a trip to the Horizon League semifinal game against Northern Kentucky University. It lost a suspenseful 84-74 to cap off their 2016-2017 season. The Penguins feature a 20-man roster which includes four seniors from last season’s team. It also features 14 newcomers. Ryan Strollo takes a baseline jump shot in YSU’s lone exhibition game on Oct. 24 against Thiel College. As for the newcomers, point guard Francisco Santiago foresees that all will be well. He described the chemistry the group has been building. He also talked about the on-court adjustments ahead for them. “On the court it’s been a little bit tougher because we’ve only had six or seven guys that have played in a Division I basketball game. That’s why these scrimmages are so meaningful because we need our new guys to get their feet wet,” Santiago said. The newbies to the team have made their presence felt. Coach Calhoun praised freshman, Naz Bohannon, in particular, who currently leads the team in scoring and rebounding currently. YSU will start anew this season with a new coaching staff with Calhoun at the helm. He hopes to integrate a pace and space style of basketball into YSU this season to up the tempo get the ball moving in transition. Calhoun also hopes to expand the depth chart to incorporate a first and second unit comprised of at least 10 players. He said the new style will spark fan interest because each player will be integrated into the games. The philosophy seems to be rubbing off on the team with each player seeming willing to adapt their games to change. 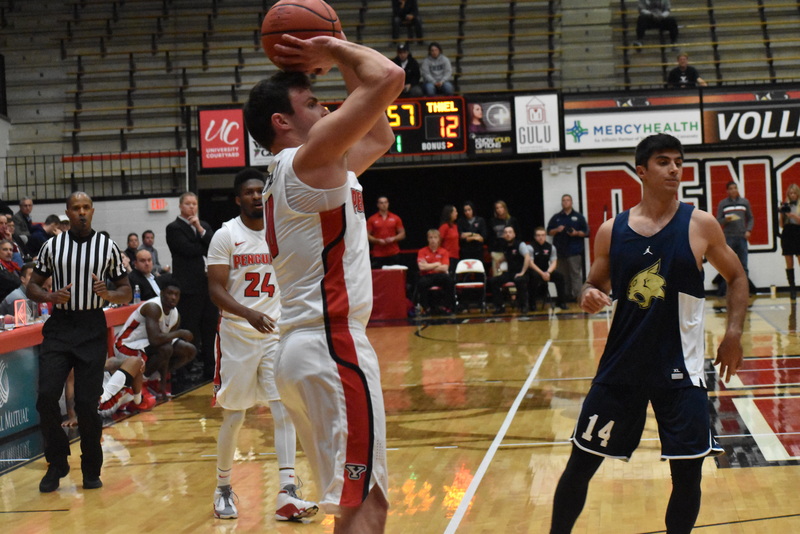 After not getting much playing time in his tenure with YSU, guard Ron Strollo will see more playing time under Calhoun’s new system. With a new role in the offense Strollo envisions what that’ll entail for him this season. Shooting guard Cameron Morse, was recently named Preseason First-team All-Horizon League. “Getting up and down the court, getting stops and easy baskets in transition is how the game is played and that’s what’s gonna help us come March,” Morse said. Coming off a dominant season, he averaged 22.9 points a game. The new style doesn’t intimidate Morse who believes he can still replicate that same output. And as for being snubbed for preseason Player of the Year? Morse just sees it as more ammunition to play all out this season. Morse said with this style he feels as though the Penguins can be top-three this season. With Santiago beside him in the backcourt, it’s a feat that feels achievable if he’s able to remain on the court. Santiago is currently nursing a knee injury that will see his minutes restricted. “Getting as far as we got in the tourney we just wanna win now,” Santiago said. “It doesn’t matter who gets the glory or who gets the fame as long as we’re the ones winning at the end of the day,” Santiago said. 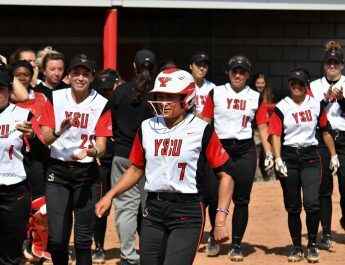 YSU will gear up to play at the University of Akron against Kent State University in its season opener Nov. 11 at 9 p.m.